If you were to fly a camera-laden drone several hundred feet above Pani Herath’s house in south Miami, Florida, it would become clear his rooftop is an oddity compared with virtually all of his neighbors. Despite living in a part of the world that bakes in the sun throughout the year, just a few thousand people across Florida, such as Herath, have installed solar panels. “Unfortunately, not many people know about solar. That’s why nobody around here has solar at all,” said Herath. He has become an object of curiosity in his tidy neighborhood, where watering the manicured lawn and scooping debris from the pool is of greater concern. Despite its Sunshine state moniker, Florida is barely harnessing its bountiful rays for energy. The Solar Energy Industries Association ranks the state third in the US for rooftop solar potential but just 12th in terms of installed capacity. Despite some growth in commercial solar, the number of Florida households getting solar panels is not projected to squeak past 100 a year until 2021, a paltry rate for a state with more than 20 million residents. This disparity is no longer a mildly diverting quirk. Donald Trump’s administration has been gleefully crushing any federal policy with any whiff of climate change about it, and the president is expected on Tuesday to sign an executive order undoing Obama’s clean power plan. So the urgent task of emissions cuts is starting to depend more heavily upon cities and states. Currently, Florida derives less than 1% of its electricity generation from solar. “Political beliefs have held solar back in Florida, and the utilities like the way things currently are,” said Schafer. Critics say the utilities are not active enough in helping develop the solar market, and rooftop capacity by homeowners, because it could be a threat to their roles supplying traditional energy sources. In many states, a solar company can lend panels to a homeowner and then sell the cheap power generated directly to the owner. But that isn’t allowed in Florida. Nor is a homeowner able to sell on his or her generated solar power to anyone else, such as a neighbor or tenants. By Florida logic, anyone with rooftop panels is providing a utility and therefore must be able to provide power 24 hours a day. And as only the state’s vast monopoly utilities, such as Florida Power & Light, can do this on demand, households are barred from this sort of third-party ownership. “It’s ludicrous that Florida outlaws such a thing,” said Justin Hoysradt, chief executive of Vinyasun. His West Palm Beach company has instead attempted to boost solar sales through loans structured like car or mortgage repayments. Florida Power and Light, which serves around 10 million people in the state, insists that it has been a proponent of solar power. 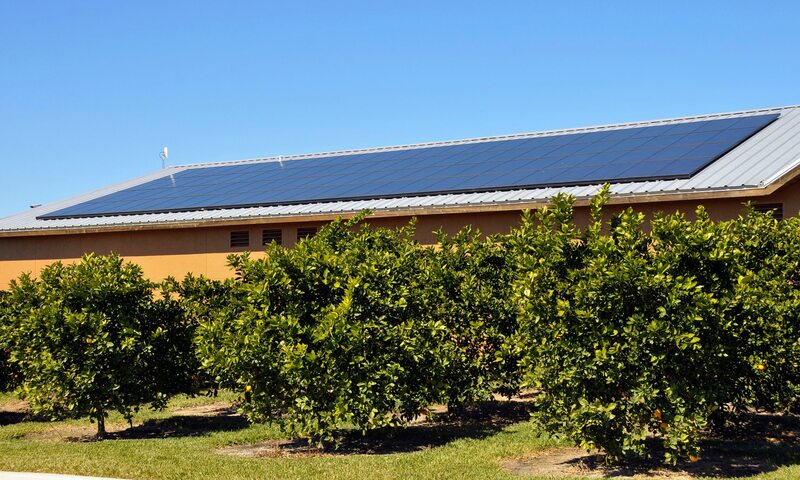 “FPL has been leading the smart, cost-conscious expansion of solar in Florida since we built our first solar power plant back in 2009,” Eric Silagy, president and CEO of FPL, said in January. He spoke as it officially connected three new solar power centers to the grid and announced plans to build eight more plants, and other local schemes, by 2018. It said the plants built last year generated enough solar for 15,000 homes and the target for next year was 120,000. The challenge to move Florida up the league table of states providing solar power could have become much more difficult if a state ballot measure hadn’t narrowly failed last year. The measure, called amendment 1 and backed by more than $20m in campaign funding from various utilities firms, was presented as pro-solar and endorsed as such by Florida’s supreme court. But critics insist it would have deceptively opened the way for new fees on rooftop solar and snuffed out the industry. Al Gore, the former vice-president, called amendment 1 a “phony baloney initiative”. Jim Kallinger, chairman of the Florida Faith & Freedom Coalition and a supporter of the amendment, said the measure would have “said no to corporate welfare” while ensuring the right to have solar panels in the state constitution. Solar will continue to be a niche industry as long as Florida maintains its cheap electricity rates, Kallinger added. “It’s hard for solar PV [photovoltaic panels] to compete with other energy sources,” he said. North-eastern states may not be bathed in sunlight as much as Florida is but the ambition for solar dwarfs that of the balmier southern state. This is driven by the retail politics of electricity prices as much as it is of acceptance of climate disruption – while New York’s governor, Andrew Cuomo, has said warming temperatures are costing the state “not only in dollars but already in lives”, his Florida counterpart, Rick Scott, will be forever saddled by reports that he banned public servants from uttering the words “climate change”. 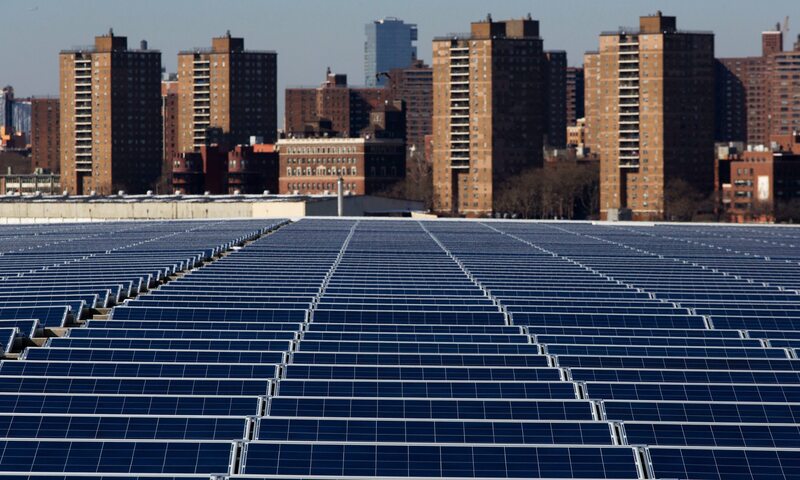 Generous city and state tax breaks, combined with the plummeting cost of solar, are starting to reap dividends in New York City, where solar panels are popping up in unexpected rooftops in the Bronx and Brooklyn. Installed solar capacity has mushroomed 800% in the past five years, with state efforts to get panels on to churches and schools. In August, Cuomo announced that utilities would be required to source half of the state’s electricity from solar and wind by 2030. Florida has no such target. NYCEEC, a not-for-profit lender, has been using loans and other incentives to get different types of buildings to go solar. Cooperative dwellings are proving an increasingly fertile area, with a number of such residencies across New York City opting to get solar on their roofs. Elmo Homes, a co-op in the Brooklyn district of Sunset Park, got an $86,000 loan from NYCEEC for its panels. With the various city, state and federal tax credits, about three-quarters of the project’s $200,000 cost will eventually be wiped out. The 30-apartment building is making energy savings of around $10,000 a year. Eric Appleton, president of Elmo Homes, said residents were interested in the environmental benefit of adopting solar but the main attraction was financial. “Rather than just saving on energy costs, we’re actually collecting that money and then we can put it into the upkeep of the building, whether that’s maintaining the exterior, dealing with plumbing issues, fixing the roof,” he said. While renewable energy remains wildly popular with the public regardless of political outlook, a perception lingers in some quarters that it is flaky and propped up by taxpayer largesse. Trump is a member of this camp, writing in his 2015 book Crippled America that the push for renewables was being driven by “the mistaken belief that global climate change is being caused by carbon emissions”. The economic reality increasingly casts a shadow over these views. Job growth in solar is outstripping the rest of the economy, with more Americans now working on installing and maintaining panels than in the oil and gas sectors combined. “There is this stigma of solar being a bunch of hippies using the solar electricity to grow pot and go to a Grateful Dead show,” said Jeff Johnston, who has worked as a solar contractor in south Florida for the past two decades.